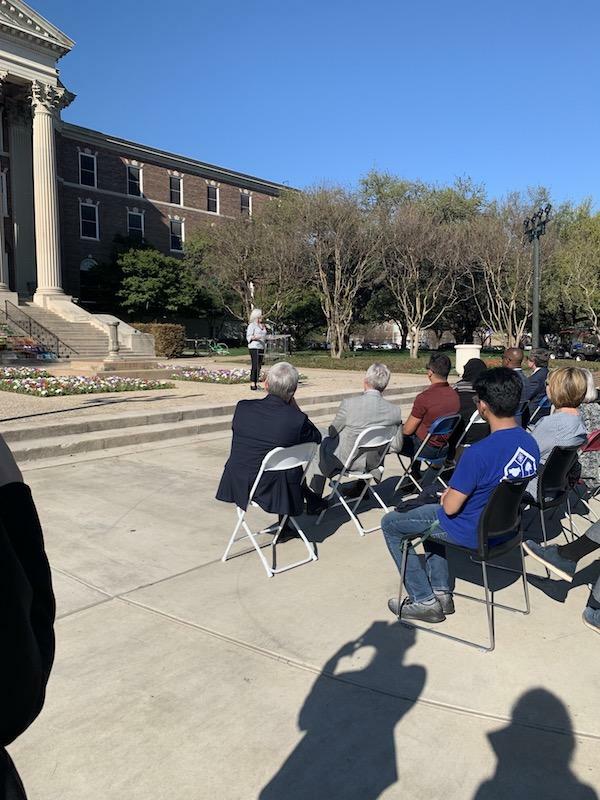 More than 80 people of different ethnicities, religions and backgrounds gathered on Monday on Dallas Hall lawn to honor the lives lost in the March 15, 2019 New Zealand massacre. Ahmed Muhammad, who initiated the event and is Treasurer of SMU’s Muslim Student Association (MSA), said he felt empowered to organize the vigil because of the kindness he has received from the Office of the Chaplain. These simple acts of kindness were remembered and celebrated at Monday’s vigil service. Five speakers drew attention to the unity that faith can bring across religions. Chaplain Rankin, President Turner, Isabel Docampo (Director of Center for the Study of Latino/a Christianity and Religions), Ameer Hamzah and Ahmed Muhammad presented unified messages of love’s victory over hatred and fear. The speakers addressed the crowd from a small podium in front of a background of 50 prayer rugs. 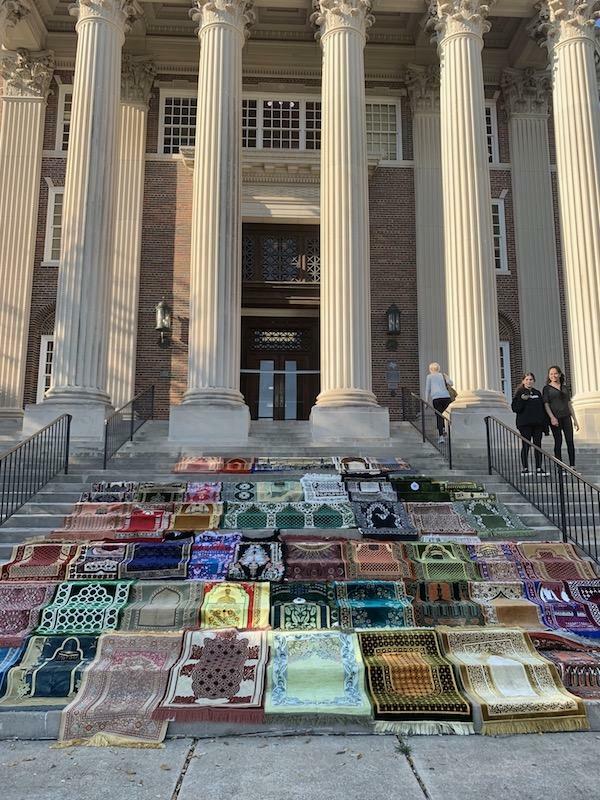 Each namaz rug represented a life lost in the massacre. Ahmed Muhammad read the names of the first five victims whose identities were reported and prompted audience members to observe a moment of silence after each name. His somber voice and the silent audience were a stark contrast to the many students lounging on other parts of the lawn, enjoying the sun after class. The speakers urged the audience to recognize the need for inter-faith friendships in their own life. Relationship is the place to start. Aisha Ahmed, biology and history senior and MSA member, said work needs to be done with inter-religious student groups on campus. “There is racism on campus, there really is,” Ahmed Muhammad said. He noted that massacres like the one in Christchurch, New Zealand start with smaller, marginal seeds of hatred before they grow into violent attacks. He said the essence, ideology and hatred behind these actions can be observed in racist remarks he hears on campus. Ahmed Muhammad said he believes that most of these remarks come out of ignorance, and that people are generally good at heart. 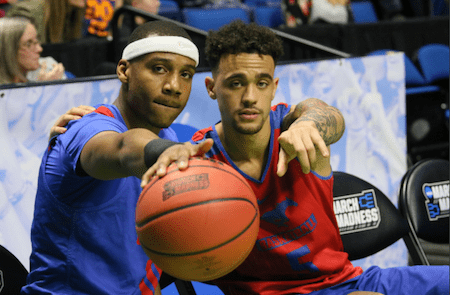 In spite of the tragedy, speakers and attendees demonstrated the desire to communicate across existing cultural and religious divisions on campus, using their faith as the foundation for their connection.